mommy bytes: Rock, Paper, Scizzors! 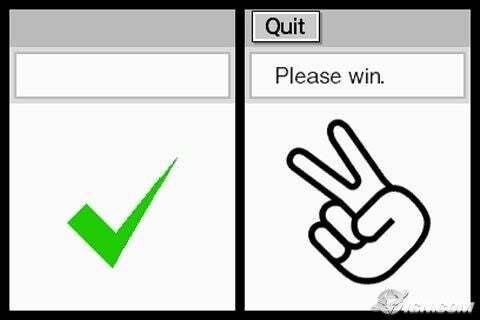 In Nintendo's Brain Age 2, one of the brain age tests is to play Rock, Paper, Scissors. You yell out the answer and the DS microphone picks it up. A friend of ours has a moderately strong New England accent, so when he yells scissors, it sounds like "Scissah's!" The DS has no idea what he is saying, so he gets a bzzt, wrong! Then he overcompensates and says "Scizzors" with an exaggerated R. Pretty funny that you can't play Brain Age 2 if you have a Boston accent. Although rock wins in this image, we all know "Rock is Dead... and Paper Killed It". Whenever I wear this Threadless shirt, there are always a few people that just don't get it at first, but it's always a winner when they do. If you're serious about RPS, check out these top secrets to winning RPS. Funny how they say that most guys open with Rock. Adam and I always start with Scissors. And there's also Rock, Paper, Scissors, Lizard, Spock. 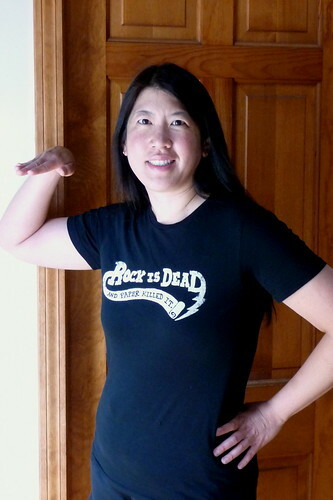 Here I am wearing this shirt at BlogHer sitting on Liz Henry's lap, who obviously prefers Spock. 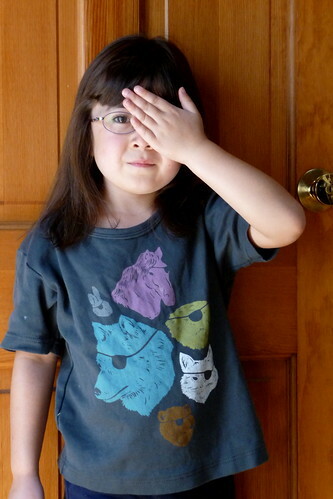 Speaking of Threadless shirts, Dova stole Adam's Animals with Eyepatches! Yes! shirt. There's something awesome about those piratous animals. BTW, check out my Threadless giveaway on contest bytes.